Kansas Wesleyan women’s basketball coach Ryan Showman hurt for his team after Saturday night’s 77-66 loss to the No. 11 ranked Tabor Bluejays in a meeting of the top two teams in the KCAC at Mabee Arena. The loss drops Wesleyan into sole possession of second place in the KCAC at 19-3 (21-7 overall) after Bethany upset No. 17 Sterling 71-68 on Saturday night. The Coyotes hold a half-game lead over the Warriors in the standings. The Coyotes battled for all 40 minutes of the game, but a big second quarter from Tabor, outscoring the Coyotes 24-13 in the period proved to be the difference maker. Wesleyan raced out to an 8-2 lead to start the game and led 10-4 before Tabor came back to get within a point at 12-11. Buckets by Courtney Heinen (JR/Axtell, Kan.) and Maddie Miller (SR/Kiefer, Okla.) pushed the Coyote lead back out to five, and after Tabor got within three again, Sydney Mortensen (SR/Wichita, Kan.) hit a big 3-point that put the Coyotes up 19-13 after a quarter. A bucket by Virja Lewis (SO/Kansas City, Kan.) put Wesleyan up eight to start the second quarter at 21-13, but Tabor battled back, using an 11-2 run to take a 24-23 lead with 7:08 left in the second. The lead traded hands several times until Tabor again used a big run, this time an 8-0 charge to take a 34-27 lead with 2:22 to go. A 3 by Heinen and a bucket by Gabbie Miller (SR/Kiefer, Okla.) got the Coyotes back within two at 34-32, but Wesleyan would trail by five at the half, 37-32. Another steal and layup by Gabbie Miller tied the game at 38 with 8:27 left in the third, but five straight by the Bluejays made it 43-38 with 6:41 to go. Tabor pushed its lead out to 53-43 at the end of the third. 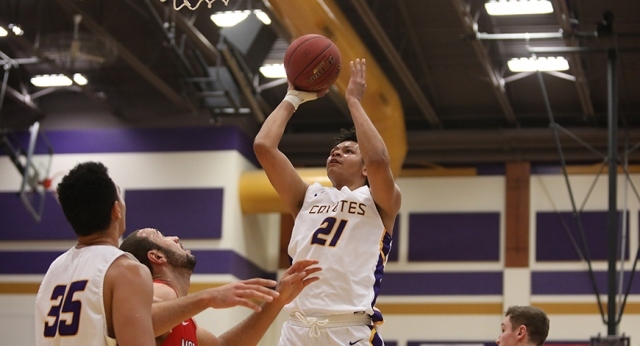 Tabor’s lead reached 18 points late in the fourth, and despite a Coyote rally, the difference proved to be too much in the final two minutes. “This was two really really good teams playing each other and I am glad of our effort tonight. Tabor was just a little bit better tonight,” Showman said. “The message I gave them in the locker room was that this isn’t the end of the story, this is just the end of a chapter. Kayla Kivinski (SR/Port Richey, Fla.) had 18 to lead the Coyotes while Heinen had 14 and Lewis 11. Kivinski led the Coyotes with six rebounds. KWU was 28-of-61 shooting for 45.9 percent for the game. Wesleyan has two games remaining in the regular season, heading to York, Neb., on Wednesday to take on the Panthers, and then a huge game to close the regular season against the rival Swedes in a First Bank Kansas Smoky Hill Showdown meeting next Saturday at Mabee Arena. Kansas Wesleyan men’s coach Anthony Monson admits he might be “getting greedy” when it comes to evaluating his team’s defensive play. It’s his insistence that his team relentlessly guard opposing teams on a consistent basis that has the Coyotes where they are today, though. KWU, which ranks second in scoring defense in the Kansas Conference (69.6 points per game), produced another stellar effort in a 71-60 victory over Tabor on Saturday night at Mabee Arena. The victory clinched at least the No. 4 seed in the KCAC Tournament later this month, meaning the Coyotes will play their first game at Mabee Arena. It also was their sixth consecutive win, eighth in their last nine games, 11th in the last 13 and raises their record to 17-9 overall, 15-7 in conference play. KWU closes out the regular season with two games next week – at York on Wednesday and back home against Bethany on Saturday. Monson’s angst against Tabor dealt with the Coyotes’ perimeter defense, or lack thereof. They entered the game leading the KCAC in defensive 3-point field goal percentage, limiting teams to 30 percent, but the Bluejays were 10 of 23 (43.5 percent) – 6 of 10 the first half. “Our goal going into the game was make sure they didn’t get loose on the 3-point line,” Monson said. “Obviously that didn’t work out very well for us. The games that they’ve won this year is when they’ve made a ton of 3-pointers. The Coyotes tightened up the second half and limited Tabor to 4 of 13 shooting from long range (31 percent), but the Bluejays shot 46 percent overall (23 of 50). Wesleyan led 34-31 at halftime and had a 38-33 advantage early in the second half before an 11-1 run gave Tabor a 42-38 lead with 15½ minutes left. The game remained close until the final seven minutes. Clinging to a 52-51 lead, KWU pulled away with a 12-2 surge, fueled by back-to-back 3-pointers by reserve guard Zach Rammelt (JR/Racine, Wis.) that made it 64-53 with 4:21 remaining. Tabor got no closer than seven (65-58) the rest of the way. AJ Range (SO/Junction City, Kan.) and James Brooks (JR/Cherokee, Kan.) were huge the entire game for Wesleyan, Range finishing with a career-high 17 points on 7 of 8 shooting and 12 rebounds. Brooks scored a game-best 20 points, including four 3-pointers, and had three steals. “A.J.’s good, man, he’s just really, really good,” Monson said of his sophomore post player. “He was really good down low when he got the ball, he made some good decisions with a couple of passes and never forced one thing. Brayden White (SO/Topeka, Kan.) was responsible for several of those passes, finishing with nine assists. Jordan McNelly (JR/Salina, Kan,) added 10 points as the Coyotes shot 48 percent (24 of 50), including 9 of 26 from long range. They were also 14 of 19 at the foul line, compared to Tabor’s 4 of 9, and had just seven turnovers after committing 23 against Bethel on Wednesday. Tabor had 13 turnovers. Diontre Cutliff had 18 points, 12 the first half, and made four 3-pointers for Tabor (7-21, 5-17). Darnell Jones-Bowie added 13 points and Tevin Berry 12. “At the end of the day we did enough to win and held them to 60 points,” Monson said.